Significant patterns of residential segregation are present today in all of the nation’s large metropolitan areas. In many cases, segregated neighborhoods were initially created deliberately to keep black families out of white neighborhoods, and our nation’s black population is still the most highly segregated minority group. Today, residential segregation is most extreme in the metros whose populations have grown the least since 1970, indicating the lasting impacts of de jure segregation in the U.S.
Those living in neighborhoods with concentrated minority populations struggle more to pay rent. In Census tracts with concentrated minority populations, the median renter income is an average of 28 percent below the metrowide median. However, median rents in these neighborhoods are only 12 percent below the metro median, leading to greater rent burdens in minority neighborhoods. Metros with higher levels of residential segregation also tend to have larger gaps in homeownership rates between white and minority households, and this relationship holds for all minority groups. Black households, in addition to facing the highest rates of residential segregation, also tend to have lowest homeownership rates. Overall rates of residential segregation have fallen since 2009, but only slightly. The metros with the fastest growing populations over that period have seen the smallest reductions — or even small increases — in their residential segregation indexes. 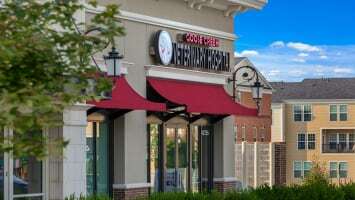 America’s cities are growing increasingly diverse, a trend that is expected to continue for decades to come. However, despite the popular notion of our nation as a melting pot, minority populations are often concentrated in specific neighborhoods, while other neighborhoods remain primarily, and in some cases almost exclusively, white. This pattern is known as residential segregation. In many cases, these housing patterns did not emerge naturally and, instead, represent the lasting impacts of policies — both informal and institutionalized — specifically aimed at marginalizing minorities, with the black population facing the worst of this discrimination. As a result of such practices, many minority neighborhoods remain economically disadvantaged, contributing to the intergenerational persistence of racial inequality in America. Although this year represents the 50th anniversary of the Fair Housing Act, we still have a long way to go to ensure that equality of opportunity is not negatively impacted by the neighborhood in which a person is raised. In order to better understand this important issue, Apartment List analyzed data for Census tracts — small geographic areas within cities, roughly comparable to neighborhoods — to see how residential segregation is currently manifested in housing markets across the U.S. and how housing costs and homeownership rates vary within metros based on tract-level racial composition. 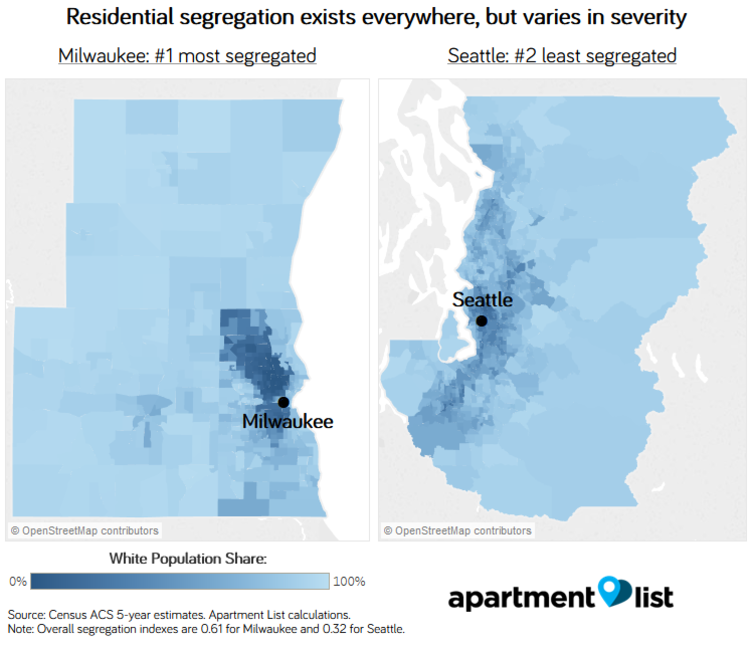 Compared to Milwaukee’s 0.61 overall segregation index, the Seattle metro has an overall index of 0.32, the second-lowest of the nation’s 50 largest metros. In comparison to Milwaukee, the map for Seattle contains a fuller spectrum of shades between the two extremes. That said, even here, there are still clearly discernible patterns of minority concentration. The presence of residentially segregated neighborhoods affects all minority groups, but the issue is most extreme for black households. Black populations are the most segregated minority group in all of the nation’s 25 largest metros except for Phoenix, where the Hispanic segregation index is highest. Across the 250 largest metros, the average black segregation index is 25 percent higher than the average index for Hispanic Americans, the second most segregated minority. The segregation of black communities is deeply rooted in our nation’s history. Exclusionary zoning and restrictive covenants openly barred black households from moving into white neighborhoods across the country until well into the second half of the 20th century. Redlining, another historic policy, reinforced racial boundaries and made it impossible to obtain a conventional mortgage in black neighborhoods, depriving these areas of the stability and wealth creation associated with homeownership. These policies and other related factors led to higher concentrations of poverty in minority neighborhoods, and the persistence of significant wealth gaps has served to reinforce patterns of residential segregation. 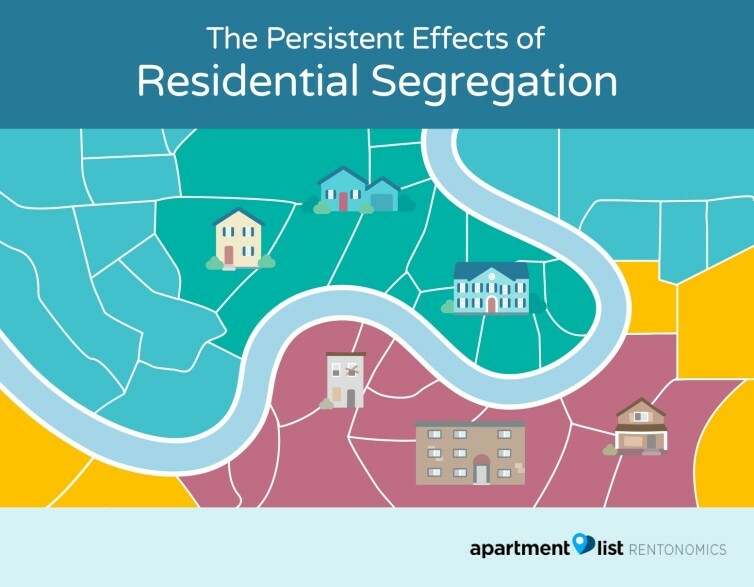 Our analysis shows that the legacy of these policies persists in today’s segregation patterns. We find that residential segregation is most extreme in metros that were well established before 1970. Meanwhile, minority populations tend to be more evenly distributed in areas that have experienced rapid growth in the decades since the passing of the Fair Housing Act. In contrast, areas whose residential development occurred largely after 1970 show the lowest rates of segregation, consistent with the persistent effects of historical policies. That said, no metro in the U.S. is devoid of residential segregation patterns, including those whose development is more recent, suggesting that historical policies are not the only factor bringing about segregation. Although explicit forms of residential segregation have been outlawed, there is still evidence that subtler discriminatory forces are at play, even today. In metros such as San Francisco, Boston and New York — which have become increasingly expensive as local economies have grown without sufficient increases in housing supply — lower rates of residential segregation may be the result of gentrifying minority neighborhoods. 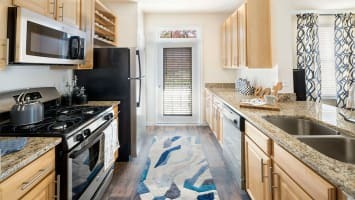 Another group of cities, including Charlotte, Raleigh and Las Vegas, are experiencing rapid growth, but have simultaneously expanded their housing supplies. These cities are seeing slight increases in residential segregation, perhaps linked to the type of residents flowing to their newest suburbs. Meanwhile, many of the Midwestern “legacy cities” seeing the largest declines in segregation — such as Detroit, Pittsburgh and Cleveland — are struggling with stagnant local economies, indicating that declining rates of residential segregation may not always coincide with better economic opportunities for minorities. 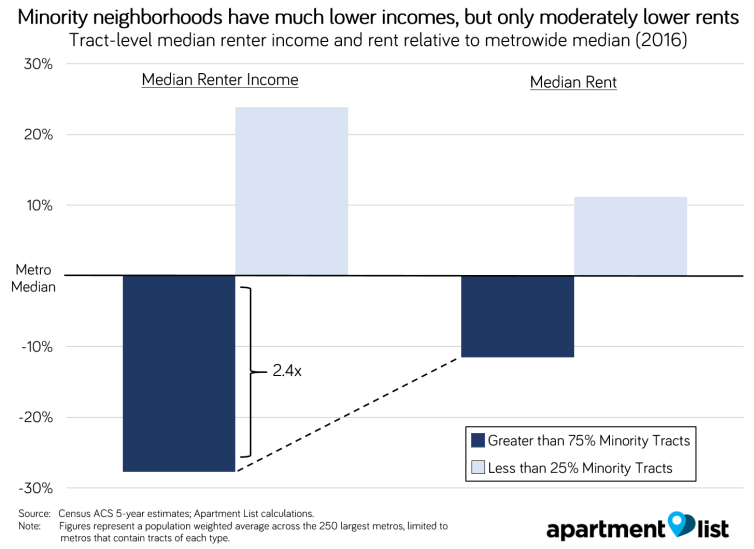 In tracts with concentrated minority populations, the median renter income is 28 percent lower than the metrowide median. Meanwhile, tracts with low minority shares have median renter incomes that are, on average, 24 percent above the metrowide median. Notably, the variation in rents across these neighborhood types is far more muted. In concentrated minority tracts, the median rent is 12 percent below the metrowide median on average, while in concentrated white tracts, it is 11 percent above the metrowide median. The orange markers representing the black populations in each metro are concentrated in the lower-right area of the chart, meaning that black households are the most segregated, and also have the largest gap in homeownership rates compared to white households. Hispanic populations (shown in grey) tend to be less segregated than black households, and in most metros, they also have higher homeownership rates. Asian households have homeownership rates that are closest to matching the white homeownership rates, as evidenced by the blue markers appearing closer to the top of the chart. Importantly, all three sets of markers display the same downward sloping trend, indicating that higher levels of residential segregation are indicative of greater gaps in homeownership rates at the metro level for all minority groups. Low minority homeownership rates are one of the drivers of inequality in the U.S., given that building equity through homeownership is the primary form of wealth creation for many households. Since the wealth accumulated through housing is often passed down across generations, these effects can persist for great lengths of time. Residential segregation was originally enforced with the explicit intention of denying America’s black population access to opportunity, and the effects of these policies are still evident in today’s housing markets. The high levels of residential segregation that we still observe make it clear that this historically-rooted problem is one that our society has not yet solved. This issue has broad implications, since the neighborhoods in which we grow up play an important role in our success as adults. Moving to a neighborhood with greater access to opportunity has a significant effect on intergenerational mobility, particularly when the move occurs early in childhood. The importance of neighborhoods goes beyond economic factors. For example, residential segregation has been linked to adverse health outcomes for minorities. These outcomes are not inevitable. Research has shown that allowing people to move away from high-poverty communities into low-poverty communities leads to significantly improved rates of college attendance and higher adult incomes for children who were younger than 13 before the move. One option for counteracting the negative effects of residential segregation is to expand benefits for low-income rental assistance and to allow recipients to use those benefits to move to high-opportunity neighborhoods. That said, cost-burden rates are high even among populations who may not qualify for government assistance, demonstrating a lack of affordable housing that affects many of our nation’s cities. Policies aimed at increasing the supply of affordable housing while also prioritizing the creation of more economically-mixed neighborhoods could go a long way toward addressing the persistent problem of residential segregation. We present data for black, Hispanic and Asian populations, the nation’s largest minority groups. All other minorities are categorized as “Other,” but because this group’s composition varies across metros, it offers limited insight and we do not present results for it here. Data for “Other” is available upon request. This relationship holds using the segregation indexes for all minorities but does the best job of explaining the black segregation index. For population weighted regressions of the 50 largest metros, with 2016 segregation indexes as the dependent variable and population growth since 1970 as the independent variable, R-squared values are 0.62 for the black segregation index, 0.14 for the Hispanic index, 0.29 for the Hispanic index, and 0.48 for the overall index. All models are significant at the 0.01 level. Full regression output is available upon request. 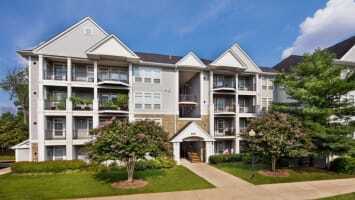 Nationwide, 50 percent of all renters are cost burdened.